Kompaktna robotska kosilica s 3 kotača za učinkovitu košnju otvornih travnjaka. Primjerena je za površine do 600 m² i savladava nagibe do 25%. Jednostavna je za upotrebu i sadrži mnogo opcija za osobnu prilagodbu. Poklopac polarno bijele boje dostupan je kao opcija. The anti-theft alarm offers maximum security to the mower, activated according to your own choice. Kada Automower® zahtjeva punjenje, sama pronalazi put natrag do stanice za punjenje. Husqvarna Automower® cuts just a little but frequently, which assures a nice and healthy lawn. It is equipped with sharp razor-like blades made of strong carbon steel mounted on a robust cutting disc system. This provides for efficient operation and extremely low energy consumption. Because it is electrically powered, Automower® produces no harmful emissions. Thanks to its unique cutting system, Automower® works extremely discreet and quiet and just when you want. Thanks to the free movement pattern of Husqvarna Automower® the lawn is perfectly cut, achieving a beautiful and carpet-like look. The razor-sharp blades cut the grass gently from all directions, helping it to grow strong. Moss growth is effectively prevented. 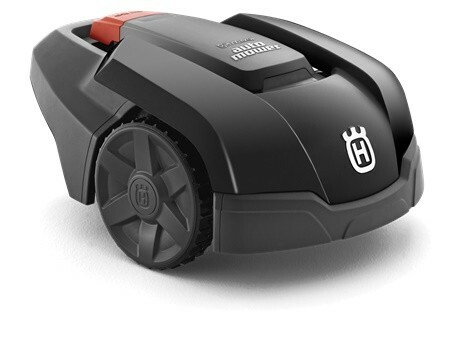 Robotic lawn mowing is all about reliability. Husqvarna has during 20 years of development refined its mower concept to achieve the highest level of reliability, quality and cutting result, with a minimum of assistance. Automower® is equipped with an effective PIN code system, which largely increase the protection of the mower. Automower® can be outside around the clock and is designed to function properly and unattended regardless of the weather conditions. Automower® is built to withstand the harsh Nordic climate without any problems. Žica za omeđivanje pomaže kosilici da nađe put natrag do stanice za punjenje, što smanjuje vrijeme traženja pogotovo u vrtovima kompliciranog oblika.